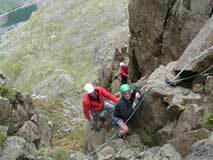 Here we are doing Slab and Notch route on Pillar Rock, then abseiling off the top into the Jordan Gap. 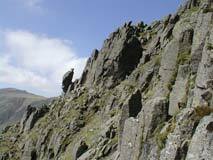 Scrambles are about having to use your hands, from the occasional dab for balance. 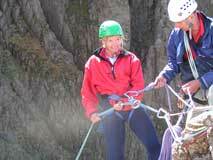 To the routes that will have small sections that require roped pitches of easy rock climbing. 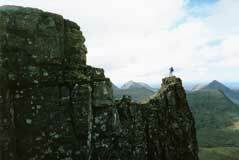 Classic scrambles such as 'The Cullin Ridge' on Skye, Curved Ridge in Glen Coe, Tower Ridge on Ben Nevis, or the lakeland classics Pinnicale Ridge, Striding Edge, Sharp Edge or Napes Ridge on Gt. 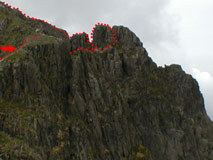 Gable. 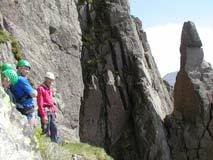 Or, We can teach you the skills that will allow you to safely tackle these exhilarating routes for yourself, or you can relax and take a guided day. 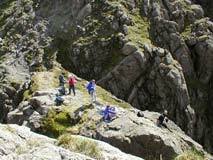 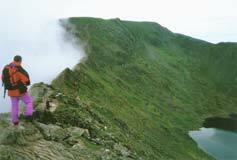 Have lunch in some of the ultimate picnic spots on your way to the top.